This entry was posted in Art and tagged Venus of Willendorf, Vienna. Bookmark the permalink. 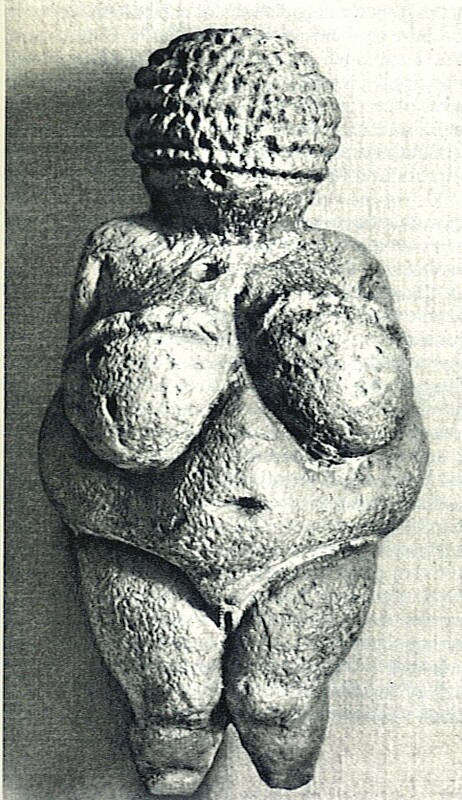 The face wasn’t the same, but I saw a lady the other night who otherwise looked like the Venus of Willendorf. She was coming out of the All-you-can-eat-for-$5.99 joint as it was closing after declaring bankruptcy. I don’t think her name was Venus, though. Have you ever tried to “carve” in stone? It would seem that the lack of power tools was a major obstacle. But then again and how true, what else would you do with all that time on your hands? You’re right — the artist must have been using flint tools, so the braided hair is pretty impressive. After all, he’s not carving soapstone or something relatively soft. This is a chunk of hard rock; had to be to survive this many millennia.